When word got out that Dominque Lafon had started making Pinot Noir in Oregon, it created quite a buzz. 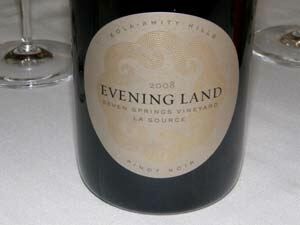 He signed on as the consulting winemaker for Evening Land Vineyards (ELV), a wine label started in 2005 by former attorney and producer and director in Hollywood, Mark Tarlov, along with partners Danny Meyer (Union Square Hospitality Group), the Prieur family of Domaine Jacques Prieur, and Dorothy Cann Hamilton, founder of the French Culinary Institute in New York City and CEO of the James Beard Foundation. 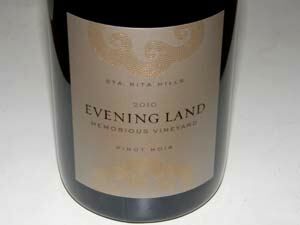 The name Evening Land Vineyards was inspired by the lure of Homer's ideal garden and is the final chapter of Homer's Odyssey. Since its founding, the winery has undergone a number of changes. Founder Mark Tarlov left the company in January 2012 and general manager Larry Stone also left the company. The remaining members of the board including chairman, Steven Webster, hired Greg Ralston as president and president and CEO in 2012. The winemaking team, however, remained intact initially. In the summer of 2012, Evening Land sold its 40 acres of Sta. Rita Hills acreage holdings to winemaker Sashi Moorman, sommelier Rajat Parr and their business partners. Moorman and Parr introduced their own estate label, Domaine de la Côte in the Sta. Rita Hills AVA in the fall of 2013. In 2014, Moorman, Parr and Charles Banks of Terroir Selections became minority partners in Evening Land Vineyards and took over operations. Winemaker Ian Burch, who had been an assistant winemaker for the firm in both burgundy and Oregon, replaced founding winemaker Isabelle Meunier. Meunier had overseen the company's wines since 2007 as well as the conversion of Seven Springs Vineyard to biodynamic viticulture, and overtook responsibility for the company's Sonoma Coast wines in 2012. Dominique Lafon, a consultant on the project, continued to play a large role. 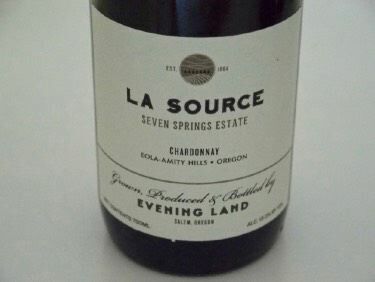 A new label, Seven Springs Vineyard, was created for wines from the estate vineyard, and the Evening Land label was for wines from sourced grapes. In 2014, Terroir Selections acquired a large share of winemaker Jamey Whetstone's two brands - Manifesto and Whetstone Wine Cellars - and hired Whetstone as winemaker for Evening Land Vineyards' Sonoma operations. Whetstone focused on the Sonoma Coast operation and its 3.5-acre Occidental Vineyard. 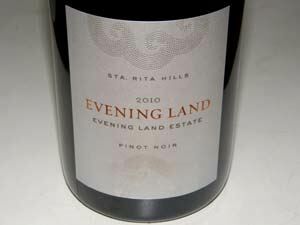 Evening Land Vineyards owns two vineyards in California, Occidental Vineyard in the Sonoma Coast (the source of Kistler’s Cuvee Elizabeth before it was acquired by ELV; pictured right) and Wind Harps Vineyard on the westernmost fringe of the Sta. Rita Hills developed in 2006. Pinot Noir from these two sites has been crafted by veteran winemaker Sashi Moorman (Stolpman Vineyards) in Lompoc. Lafon declined to make Pinot Noir from California, claiming the wines were too extracted and high in alcohol. Instead, he consulted with winemaker Isabelle Meunier, who formerly worked at Le Clos Jordanne in Niagara, Canada, on the Oregon Chardonnays and Pinot Noirs. Christophe Vial produced wines in Beaune. As widely reported in the wine press, Tarlov and his investment group signed a 45-year lease in 2007 of Seven Springs Vineyard, a revered 62-acre Pinot Noir vineyard in the Eola-Amity Hills appellation. Tarlov had been attempting to purchase the vineyard outright since 2004 without success. Seven Springs Vineyard was split by divorce of the original owners of Seven Springs Vineyard in 2001 into Anden Vineyard, owned by Al McDonald, and Seven Springs Vineyard, owned by his former spouse, Joni Weatherspoon. When Joni died in 2003, her children took over ownership. The vineyard has been rechristened and unified as Seven Springs Vineyard under the ELV lease. Seven Springs Vineyard has been the source for Pinot Noir from several esteemed producers including Adelsheim, Bethel Heights, Cristom, Domaine Drouhin, Evesham Wood, Penner-Ash, Rex Hill, and St. Innocent. None of these wineries continued to receive fruit after the 2008 vintage. St. Innocent will be the most affected as they source about a third of the fruit originating from Seven Springs Vineyard. Considerable investment by ELV is being directed at enlarging and improving the vineyard which has some phylloxera damaged vines over twenty-five years old. A new trellising system and biodynamic strategies have been instituted. At one time, a total of 120 acres of heritage vineyards were farmed organically by Evening Land Vineyards, producing 13 Estate wines. There was a mix of old vine own rooted Oregon and California heritage clones, cuttings from established Pinot Noir and Chardonnay vineyards of Burgundy and an experimental block of Pinot Noir grown from seed. 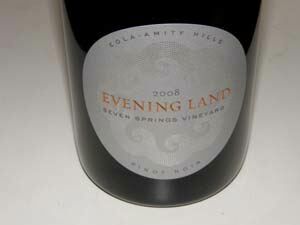 Evening Land Vineyards had wineries in Lompoc, California, Carlton, Oregon and Beaune, France. The first wine, labelled ELV Celebration, was a Gamay Noir released in 2008. 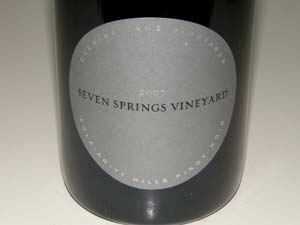 Two 2007 ELV Seven Springs Vineyard Pinot Noirs followed in 2009. 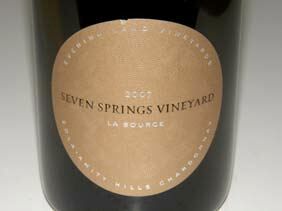 By 2011, multiple Oregon and California bottlings followed including three wines from Seven Springs Vineyard in the 2009 vintage: Seven Springs Estate Pinot Noir, Seven Springs Estate "La Source" Pinot Noir, and Seven Springs Estate "La Source" Chardonnay. 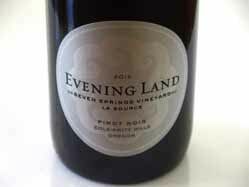 With the 2014 vintage, Evening Land became the name of the winery, producing exclusively Pinot Noir and Chardonnay from the Seven Springs Vineyard. The 2014 vintage was the 30th anniversary vintage from Seven Springs Vineyard and also marks the first vintage with Parr and Moorman as the sole stewards of the vineyard. New labels were designed by Michael Kirts. Ben DiCristina is also part of the winemaking team. In 2014 an Anden Pinot Noir was produced in small amounts from old phylloxera-affected vines and was available only as part of a 12-bottle case including the winery's other 3 top bottlings: La Source Pinot Noir, La Source Chardonnay and Summum Chardonnay. 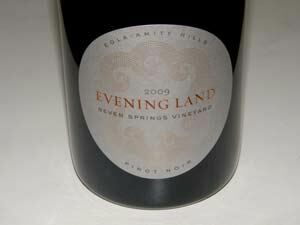 The Estate series of wines included Seven Springs Pinot Noir, Seven Springs Chardonnay and Seven Springs Gamay Noir. The original ELV wines had pricing based on a color-coded system with a range from blue, silver, gold and white labels, with white being the most expensive at about $120 a bottle and blue the most inexpensive at about $35 a bottle. 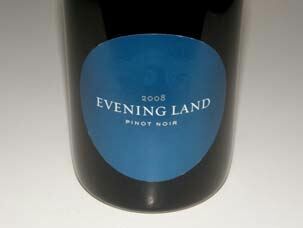 In 2014, new labels were designed for the Evening Land brand. Current annual production is 4,000 cases, of which 100% is estate grown. In 2018, the winemakers were Ben DiCristina and his assistant Julian Elam. 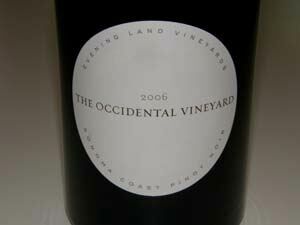 The Chardonnays from Oregon have set a benchmark for that state. To sign up for the mailing list or to purchase wines, visit the website. A tasting room is located in Dundee.